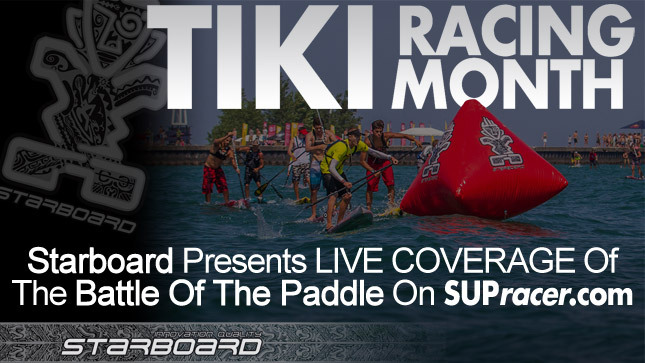 We’ve just finished an amazing opening day of racing here at the Battle of the Paddle, with epic performances across both the men’s and women’s Elite Race finals producing perhaps the most memorable day in SUP racing history. The organisers were certainly vindicated in having chosen to run a separate women’s Elite Race final with the girls putting on a big show. Jenny Kalmbach pushed Annabel Anderson right to the line while the Aussies stepped up and showed their strength, with Karla Gilbert living up to her dark horse reputation in claiming third and Molokai champ Terrene Black fighting all the way for fourth, ahead of a strong Mariko Strickland. After a slow start Annabel controlled the entire race, hitting the Golden Buoy first and never losing the lead. But despite the odds Jenny refused to give in and came very, very close to an upset. At the end of the penultimate lap, Jenny caught a large set from the outside, held her rail and surfed up to Annabel, with the two leading ladies hitting the beach together and starting the final lap side by side. Jenny hung onto Annabel’s tail for almost the entire final lap before a fall just 400 meters from the line lost her valuable ground. The women’s Elite Race final was more exciting than any of us predicted. It was great to see the girls getting all the spotlight for a change, rather than being stuck in the middle of the men’s group. This was definitely a big step up for the women’s side of the sport. Then it was time for the men’s race… Despite a ridiculously deep field featuring dozens of new faces, it was a repeat of last year as Danny Ching, Connor Baxter and Kai Lenny broke the rest of the field on the second lap. After a slow start, Danny was playing catch-up the entire race, while Connor and Kai were setting the pace. But after Kai caught a little bump and pulled away from his Maui rival, something clicked into gear and the young star went on an absolute rampage. Kai Lenny’s performance was flawless. He raced the perfect race, which is exactly what he needed to do to get past Danny and Connor. So, despite a new breed of racers stepping it up this year, the men’s top three was a repeat of last year, only in slightly different order. Travis was forced out of yesterday’s main event due to injury, having dislocated his knee while surfing in Hawaii just two weeks ago. It was a cruel blow for the Aussie, who has been on fire this year and would have started one of the hot favourites for sure. Trav can hardly walk right now, let alone run, so the Elite Race and its soft-sand chicane run would have been impossible. But he can still paddle. So Travis signed up for the Distance Race, still not sure if his leg would hold up but determined to show his true form. With the traditional Distance Race water-start being scrapped this year in favour of a beach start (which involves a short run into the water), Travis was on the back foot from the beginning. Literally. But in a sign of just how strong this guy is, the Molokai-2-Oahu champ was first to the Golden Buoy that lay 400 meters off the beach. From there the likes of Travis, Danny Ching, Beau O’Brian and Kai Lenny led the pack as the field started to thin out and the inevitable draft trains began to take shape. While there were a few classy Unlimited paddlers out front (Chuck Glynn, Ryan Helm and Brennan Rose controlled the front of the race on their 17 and 18 footers), most of the big names were in the Elite 14 foot division. 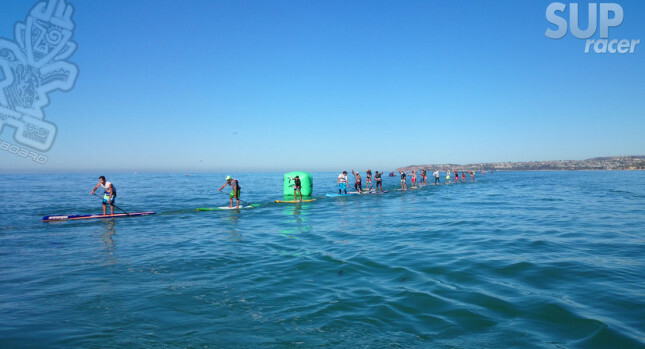 The lead draft train was quickly whittled down to 15 paddlers as its pace motored along. Danny Ching spent much of the race on the front, as did Travis and his fellow Gold Coaster Beau O’Brian. The other top guys sat in the draft train, either hanging on for dear life or playing it smart and saving energy. As the group rounded the halfway turning buoy near San Clemente Pier, the group was still looking safely bunched together. This was bad for Travis: Being unable to run, there was no way he could hit the beach in a pack – the other guys would sprint straight past him on the final, 40 meter soft-sand run up to the finish line. So Trav’s strategy was clear: He had to somehow break the pack so he could hit the beach with a clear lead, but that was always going to be difficult when Danny Ching and Beau O’Brian were taking turns setting the pace at the front. Travis had no choice though and so at the 8 mile mark he went for it, slowly drifting off the front of the train and moving about 30 meters closer to the beach, where he began paddling in parallel to the lead pack. The move paid off and pretty soon Travis had roughly a ten-board-length lead on Danny and the rest of the pack, but it was going to be almost impossible to hold onto. Like a lone escapee in a Tour de France mountain stage, Travis simply had to grit his teeth and soldier on, all while setting his own pace and not getting any relief from drafting. Coming towards the final turning buoy, which was sitting 300 meters out from the finish line on the beach, Travis was still, somehow, in the lead. Just reaching that first buoy on his own was an amazing performance. Trav was at a huge disadvantage to the rest of the field in this race: His knee caused him to have a slow start and a really slow finish, plus it impacted his paddling technique as well, where a lot of pressure goes on the legs. But that wasn’t even the worst of it: Because he couldn’t run to the line, Trav had to finish clear of the pack and that meant he had to break away early. So for the last two miles of the race, while most of the guys were utilising drafting (except for Danny, who was pulling the train), Travis had to do all the work and set his own pace. If we stopped the race at that buoy it would have been fitting, but unfortunately the finish was on the beach and Trav still had work to do. Rounding the buoy about 6-8 board lengths ahead of Danny, Beau and Zane, Travis desperately tried to find a bump that would take him to the beach with a clear gap. But it wasn’t happening. Two bumps went through that were too small to catch, then a third one appeared and it looked like Danny would catch it and surf up alongside Travis. But the defending Distance Race champ missed it by half a stroke allowing Travis, who was still 10 meters ahead, to catch it by himself and surf into the beach alone. As he hit the sand, Trav literally hobbled up the line to hold on and record a memorable win by just a few seconds from Danny, with an absolutely stellar third-place performance from Zane Schweitzer (seriously, this guy has been a revelation the past 48 hours…) followed closely by Starboard teammate Beau O’Brian in fourth. Travis Grant’s win was equally impressive and inspirational, making for a sweet end to the bitter taste of having to miss the Elite Race yesterday. It also caps off a huge year for Trav, with a number of wins throughout the season (including his epic Molokai-2-Oahu victory two months ago) showing he’s one of the very best. Trav is also the only person, ever, to beat Danny in either a California or Hawaii BOP Distance Race, ending Ching’s six-in-a-row streak. Speaking of the former champ, big credit to Danny for pulling the entire lead draft train along for most of the race. Beau O’Brian and Travis were leading at times, but Danny definitely did most of the work and refused to give up. Travis’ efforts in out-paddling the field over the final two miles were amazing, but likewise Danny’s determined performance shows the young guns haven’t quite taken over just yet. So the long distance event, which has generally been a fairly mellow afterthought in comparison with the Elite Race festivities, had suddenly created a classic race… and that was just the men. The women’s race was just as exciting as the men’s, but for different reasons. While the men had 10-15 guys leading the way the whole race, the women’s field was only a four-way battle. 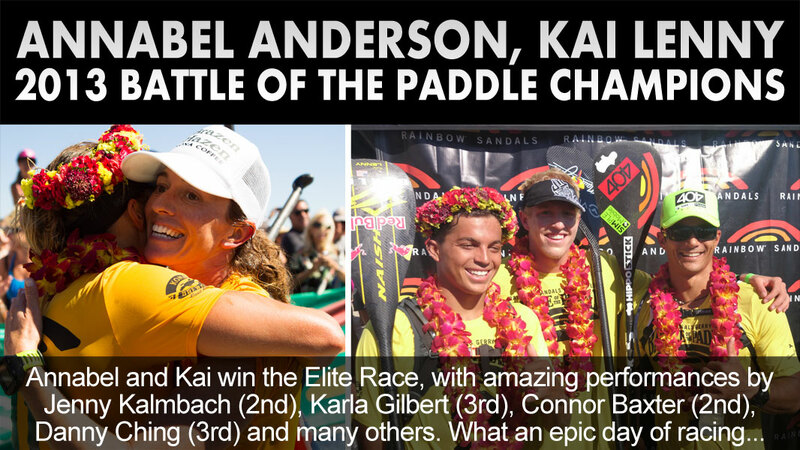 However it was the identities, or rather the origins of those four paddlers that made this such a great race. New Zealand, Australia, Canada, Hawaii. No California. Sure, Candice was sitting this one out with injury, but the results from the past 48 hours have seen a noticeable shift at the top of women’s professional Stand Up Paddleboarding. While the men’s sport quickly evolved into an international affair, the women’s side has remained rooted in its home of California for much longer. But no more: Yesterday’s Elite Race saw a New Zealander, 2x Aussies and 2x Hawaiian girls on the podium (the first California-less podium ever), while today the top four were spread right around the Pacific. In a similar thread, this year has seen a new wave of talented young girls step up and challenge for the limelight. As with the topic of internationalisation, the men’s sport has seen a shift to the young guns over the past few years while the older guard of the women have hung on. But this year we saw several teenage girls putting on impressive performances that gives big hope for the future of this sport. But despite this new wave of female talent, last year’s Distance Race winner Annabel Anderson showed that she’s still the one to beat. The Kiwi had company from the other girls early but soon made her move, rounding the halfway mark with a 30 second lead and then going on to extend it right to the finish line. This is no easy race, especially after Saturday’s draining action, but Annabel proved she’s a phenomenal athlete who stands slightly above the rest of the women’s scene right now. Today’s win makes it a clean sweep for Annabel Anderson for the second year in a row, giving her the honour of being the first ever paddler to take what I’m nicknaming the “Double-Double” – winning both the Elite and Distance Races at the California BOP two years in a row. This win was also validation for Annabel. 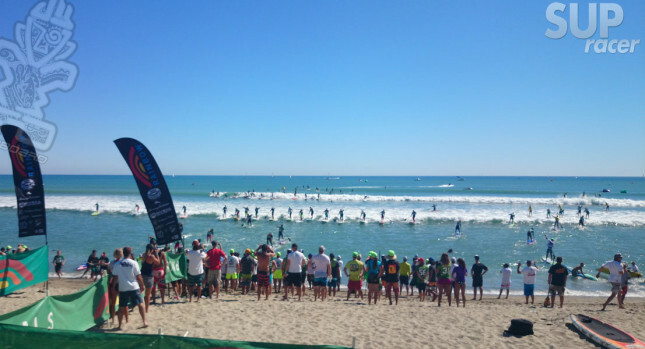 The Kiwi had to fight extremely hard in the Elite Race yesterday, where she got no relief from any waves and had to grind her way to victory ahead of a determined Jenny Kalmbach. But today it was all hers, finishing well clear of another impressive performer, Karla Gilbert – the 38-year-old who has long been an ocean legend in Australia but was a dark horse coming into this event. Karla’s third place in the Elite and second in the Distance were phenomenal. Along with guys like Zane Schweitzer and Casper Steinfath, Karla is definitely the revelation of this year’s BOP. Coming home third was another paddler making a name for herself this year: Canada’s Lina Augaitis. Lina much prefers flatter, longer races as opposed to the surf race we saw yesterday, so this was her chance to shine. And that’s exactly what she did, coming home third ahead of Jenny Kalmbach. Two exciting Elite Race Finals. Two exciting Elite Distance Races. And that’s before we even get onto the Team Relays (where the two Naish teams put on a dominant display to take 1st and 3rd), the gigantic Open Race (where Bart de Zwart was so far ahead he did a victory lap) and the super-sized kids’ races (the future! ).